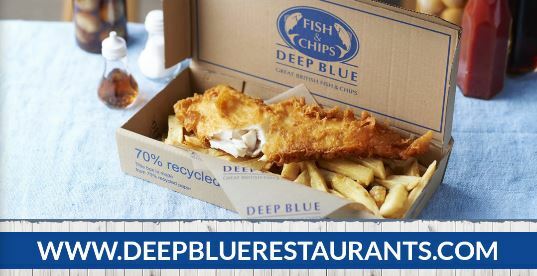 Deep Blue Woburn Sands, Fish and Chips, 47 Station Road, Woburn Sands, Milton Keynes, MK17 8RX have now been awarded our highly revered Good Food Award for Fish & Chips – Gold Seal for 2019. Our Gold Seal is the highest accolade bestowed by the Good Food Awards and is reserved to those achieving our award for three consecutive years or more. Premises must maintain the same exceptional standards that gained them initial entry into our awards over a three year period. Truly making this achievement the marque of distinction. This Fish & Chip Shop / Restaurant has demonstrated exceptional levels of food quality, service and value when compared to our industry benchmarks in their category and have now maintained this formidable standard for three or more consecutive years. 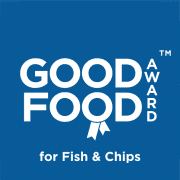 In recognition of this achievement they have been duly awarded our highest accolade the Good Food Award for Fish & Chips – Gold Seal for 2019 | Good Food Award Winners in 2017, 2018 & 2019. I have visited three times and can honestly say they should be rewarded with the worst customer service award. Visit 1 The chips even after asking where not gluten-free when I got home and then called to check again was told no they are not does it matter ! They had what can only be young people working behind the counter and not just unhelpful but more interested in talking to there mates in there. Final chance and very last visit. Called on phone to save me time, order not ready and when I asked was informed we do not start the order till you arrive. What a waste of time and money.